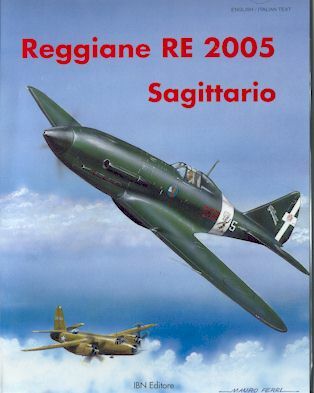 The Regianne RE 2005 Sagittario (Archer) was one of the three "Serie 5" Italian fighters based on a licence built version of the famous Daimler-Benz DB 605 engine. The combination of this powerful and well proven German engine with sleek Italian design created a graceful aircraft quite capable of holding its own against contemporary Allied fighters including the Mustang and Spitfire IX. Of the three final generation Italian WWII fighters, the RE 2005 was the rarest due to limited, hand-built production. Only about 30 were completed. Maurizio Di Terlizzi once again puts his research, writing and modelling skills to good use by creating another excellent reference book for a great Italian aircraft. This volume shares the common structure of the series. It commences with a brief but relevant historical summary; a technical description with drawings; a detailed description of models and accessories and notes on colours. The RE 2005 wore fairly plain schemes compared to its Serie 5 contemporaries, the Fiat G.55 and Macchi C.205. Nevertheless, these are well illustrated in colour plates by Mauro Ferri. Colour photography is also used to highlight Maurizio's beautiful models, including a 1/48 scale Falcon vacform with a fully detailed engine. This book will be of great help to anyone planning to build a model of the RE 2005 in 1/72 or 1/48 scale. It will also be of interest to any fans of Italian WWII aviation. Thanks to Ken Lawrence from Pacific Coast Models for the review sample. The entire range of IBN Editore books are available from Pacific Coast Models. IBN Editore titles purchased from Pacific Coast Models include loose-leaf translation of the book's Foreword, plus an English-language biography of the Author.